“Witness: The Legacy of Heart Mountain,” a KABC-TV documentary produced by David Ono and Jeff MacIntyre, is a recipient of a 2014 Edward R. Murrow Award from the Radio Television Digital News Association (RTDNA). The half-hour documentary, which aired last year, won in the Region 2 (California, Guam, Hawaii, Nevada) news documentary category for large-market television stations. This year, RTDNA awarded 661 regional Edward R. Murrow Awards in 14 categories, including overall excellence, breaking news, investigative reporting, and website. RTDNA received more than 4,000 entries during the 2014 awards season, surpassing 2013 by more than 500 entries and setting an all-time record for entries in what proved to be one of the most competitive Edward R. Murrow Awards seasons in RTDNA history. Regional winners automatically advance to the national Edward R. Murrow Awards competition, which will be judged in May. National awards, including those for network news organizations, will be presented at the New York Marriott Marquis in New York City on Oct. 6. 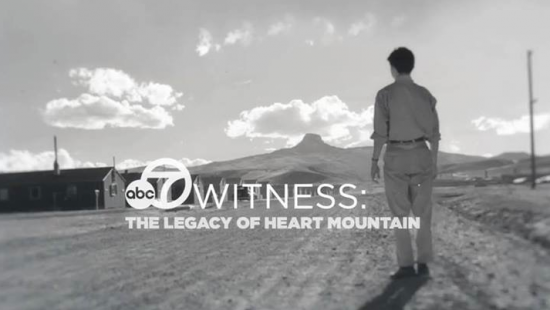 Ono and MacIntyre interviewed Japanese Americans who were interned at Heart Mountain or whose parents were interned, and also visited the camp site and the Heart Mountain Interpretive Center in Wyoming. Interviewees included Patti Hirahara, whose father and grandfather took thousands of photographs documenting camp life, and Judge Lance Ito, who keeps a photo of Heart Mountain in his courtroom as a reminder of the injustice done to his parents. Over the past year, Ono and MacIntyre have expanded the documentary to a full hour, adding the stories of Norman Mineta and Alan Simpson, who became friends as Boy Scouts in Wyoming and later served in Congress; Tak Hoshizaki, who resisted the draft to protest the violation of his constitutional rights; Stanley Hayami, a young artist who joined the 442nd Regimental Combat Team and was killed in action; and Clarence Matsumura, who rescued prisoners from the Dachau death camp as a member of the 522nd Field Artillery Battalion. The expanded version, which was recently screened at the Japanese American National Museum, will air on ABC7 on Saturday, May 10, at 9 p.m.
“We are thrilled to have a prime-time time slot … It’s not often this issue gets such a high-profile position,” Ono said. The broadcast is part of Channel 7’s observance of Asian Pacific American Heritage Month.